Katie Laird has an article in this weeks Houston Business Journal! It’s probably already happened. A colleague, relative or friend sends a "This is so cool!" e-mail with a link to an online video on YouTube or another Web site. It may be a news clip, silly home video or a heart-warming snippet from a family gathering. The mass appeal and growing availability of online videos is changing the way people consume information on the Web, and savvy businesses are trying to keep up. Cross posted here. Congrats Katie! Working on our vision and values statements. Well, I side with Jack Welch that I am accountable for the vision and the team must generate the values. And they did. And they are awesome! So awesome in fact, that I now need to be sure the vision statement is big enough to handle the scope of what we are doing. Only time will tell. 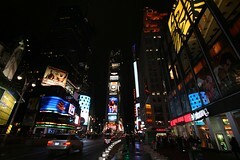 The photo is from the American Advertising Federation Annual Conference last year. 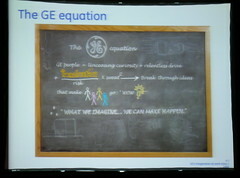 It is the GE Equation. Click through to all sizes to see the whole formula. I apologize for the resolution, but content is there. I started off using the free video editing software that came with my PC and Camstudio and a $10 microphone. Later, as my skills improved I invested in Camtasia (approximately $300) which is considered the gold standard for screencasting and a decent USB microphone. Other PC users have told me they use SnagIt ($40) which captures screen and audio and an entry level video editing programs like Adobe Preimere Elements or Sony Vegas which retail for approximately $100. Many people who work on the MAC platform use Snapz for screen capture and pull it into Final Cut Pro for editing. A new MAC tool called "IshowU" is gaining popularity. Example video here on adding an article to Tendenci. And on that note, here are the Tendenci help videos and the Tendenci software update blog. Yes I remain off topic. This photo titled "running with the seagulls" is my submission to JPG magazine – hey, I would appreciate a vote! The original version is here. Use the icon above to vote for "running with the seagulls" on JPG here. Warning – geek posting today. Via whurley and silona, if you are a programmer and want to dig into some fun non profit projects, consider attending the Codeathon in Austin on April 14th and 15th. Designathon/Codeathon 2.0 — Help build open source web apps for non-profits! This April, put your stunning design skills to use for charity! Designathon/Codeathon 2.0 is the second in a series of volunteer events based in Austin, Texas to help build usable, accessible, open source web tools for use by the non-profit community. Full text of the email after the jump. Company K Media has a recap of three major non profit benchmark reports. The full non profit benchmark report is here. Between family, work, tendenci, flickr, blogging, joost and now twitter, I needed a break. MOMA it is. Erica O’Grady interviewed by Scoble at SXSW. And oh ya, Andy Baron of Rocketboom too. Netsquared Next Week – And Nominate! This month’s Houston Net2 meeting with Robert Brackenridge IS scheduled for next Tuesday March 20th. Same place – stag’s head. Sign up with meetup for the Houston Net2. And on the topic of Net2 – please NOMINATE! If you are working on a project, or know of a project (including your own) that you think should be nominated, fill out the quick and easy Net2 submission form by April 6th. Note that the innovation fund has some $$ and I can’t think of a non profit that would not benefit from a little cash. So NOMINATE! 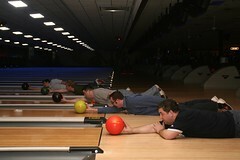 I accidentally did a brand supporting staged photo for cingular at the Avalon Star Bowling Tournament. And I am not even that big of a cingular fan! But still, it was fun. And this does go to show that creative advertising has …. um …. legs. And the number of new bloggers is still growing, but is now flattening out. I meant to link to a few more posts on twitter, but I haven’t had time to go through them all. This just in. Twitter is officially at the tipping point. Twitter is an SMS like or IM (Instant Messaging) like service that asks one questions; "what are you doing?" what you’re up to”¦ right now. Inkoluv pushed me over the edge to sign up. So yes Erica, you have been bugging me about twitter for months. You too Kelsey. And now I am on twitter at twitter.com/eschipul/. Are you people happy now? Mainly I don’t miss out on any of the SXSW action over the next few days. It will be interesting to see if it "has legs" after the conference. Dodgeball? Always had potential. Never worked right. I declare it dead. Sorry! The beer launching fridge has been making the rounds of email and blogs. And indeed, anything that launches a beer across the room so you don’t have to get up? Well that is a good thing here in Texas. And apparently elsewhere as well. Yet watching the video I saw something I found amazing. $3212.09 in earnings from MetaCafe. Probably enough to cover this guys beer project. So if he posted it on youTube he makes nothing. Metacafe Producer Rewards and he makes 3k? Um. Beer or Free Beer. 3k = carbon-neutral-free-beer – so HECK YA! So youTube is like community theater, and metacafe is like Hollywood? I am just saying talent WILL follow the money.